Ethnic groups: Han Chinese 91.9%; Zhuang, Manchu, Hui, Miao, Uygur, Yi, Mongolian, Tibetan, Buyi, Korean, and other nationalities--8.1%. Life expectancy: 70.0 years (overall); 68.6 years for males, 71.5 years for females. In a brief statement read at a mass rally held yesterday before one of the massive gateways to the Forbidden City in Peking, Mao Tse-tung, who on the previous day has been unanimously elected chairman fo the central People’s Government of the People’s Republic of China, formally prochlained the inauguration of the new regime. It was an epoch-making moment in the history of Asia. Though not all of China is yet in the hands of the Communists, there can be no doubt that, for good or for evil, this is now the Government of nearly 500m. people, the largest single homogeneus racial group in the world. Mao Zedong(simplified Chinese: 毛泽东, traditional Chinese :毛��|, pinyin: Máo Zédōng, Wade-Giles: Mao Tse-tung) (December 26, 1893 �C September 9, 1976) was a Chinese revolutionary, political theorist and Communist leader. He led the People's Republic of China (PRC) from its establishment in 1949 until his death in 1976. His theoretical contribution to Marxism-Leninism, military strategies, and his brand of Communist policies are now collectively known as Maoism. China, (CNN) -- China in 1978 was stranded at a political crossroad. It was just emerging from the chaos of the Cultural Revolution and the death of Chairman Mao. 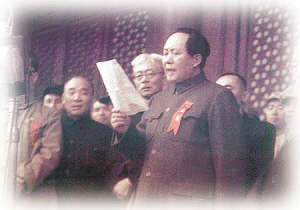 Deng Xiaoping had emerged as the new leader, but Mao’s dogma remained deep-rooted and seemingly immutable. In and outside the Communist Party, a debate raged: Where to, China?